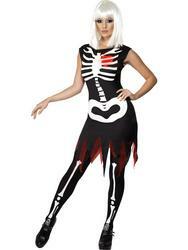 Rattle your bones this Halloween with our gorgeously scary ladies Skeleton Girl Costume. Included is a short black dress styled with a white skeleton rib cage print to the bodice alongside a matching bone print to the sleeves finished with a grey and black netted skirt styled with a jagged hemline. 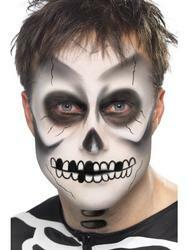 Adding the finishing touches to this stylish Skeleton costume is a gorgeous black satin bow. Ideal for a Letter S themed fancy dress party and hugely popular for Halloween.